Young Investors!- Make money in Malaysia and Singapore! Blog about how a Malaysian doctor invests his money! All ideas about investment are welcome. Nowaday, it is hard to find a nice condominium in Penang below RM300k. 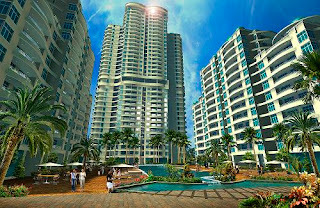 Rececntly found out this condominium and suprisingly it is below RM300k. The Oasis is situated on a parcel with land area of approximately 6.5 acres. The subject property is located off Jalan Yeap Chor Ee and sited next to the west of Minden Heights and lies in between Jalan Kaki Bukit/Lorong Bunga Raya. Adjacent to the subject land is the Custom Village and an undeveloped site which belongs to the RTM (Kementerian Penerangan Malaysia). It is located approximately 18 km due south of Georgetown and 5 km due west of Penang Bridge. It is easily accessible from Georgetown via Jalan Sultan Azlan Shah, Jalan Scott, Jalan Yeap Chor Ee and Jalan Valley. Surrounding developments within the vicinity are mainly residential and commercial developments. Located opposite the subject property and due west are rows of government quarters and due east are rows of bungalows, double storey semi-detached houses and single storey terrace; and the custom village which is under construction. Bukit Jambul Complex is located nearby and within 15 minutes drives due south of the subject property. Commercial and retailing activities are concentrated mainly within the Bukit Jambul Complex and Bandar Gelugor area. Housing neighborhoods nearby include Minden Heights, Taman Gelugor, Taman Brown, Kampung Kastam, Taman Tun Sardon, Taman Pekaka, University Place and Taman Bukit Jambul. The wet market of Taman Tun Sardon is located nearby and within walking distance due south of the subject property. University Science of Malaysia is located at Jalan Yeap Chor Ee and within walking distance due south of the subject property. Located opposite the subject property at Jalan Sultan Azlan Shah is RECSAM. Since it is so strategically located but why it is still so afforadable?? The catch is it is a not freehold land! Do you think it is a good time to buy property in Malaysia/Singapore NOW?? Is Penang Property Price too High? How to distribute your money? Get FREE Investing Tips and ebooks!